BLOG: Keep your eyes on this blog as your go-to source for hair & makeup notes, picture times & more information! HAIR & MAKEUP INSTRUCTIONS: This week we’ll put out hair & makeup notes for each class. If you have any questions/concerns/requests for help with hair and/or makeup, don’t hesitate to ask! CLASS PICTURES: Ludwig Photography will be in house Tuesday, May 29 through Thursday, May 31 to take class & individual pictures during regular class time. Please wear your costume and have hair & makeup done. Classes for Monday, May 28 will NOT be held due to Memorial Day – Monday class pictures will take place during the Friday, June 1 rehearsal. We would appreciate all dancers participating in the class picture. Having additional, individual pictures are optional. While pictures of your dancer are a great memento, there is never an obligation to buy. Picture order envelopes are in the studio this week! RECITAL DVDs: Jaime Cruz Videography is again capturing our recital this year! DVD order forms will be arriving shortly, and will be due on or before rehearsal night. FLOWERS: The Wild Rose Flowers & Gifts (formerly Fresh Flower Fantasy) is again offering a pre-order for presentation bouquets. They have a $10 and $20 option (please pre-pay). Pre-orders will be brought to LHS on recital day for pickup. They will have a limited number of additional presentation bouquets on hand to purchase at LHS – they encourage ordering ahead as much as possible! REHEARSAL CHECK-IN: Please arrive at LHS for rehearsal Friday, June 1 by 5:15 pm. We’d like to start on time at 5:30 as much as possible. You’re more than welcome to sit in the auditorium and watch rehearsal! You’ll see the signs directing you to the “green room” (band, orchestra or choir room, first right turn when you come in the main doors). You’ll need to sign your child in and provide emergency contact info. Signing your child in and out is mandatory for keeping our dancers safe & accounted for. They are expected to remain in the green room and we will have chaperones present. Please remind your child that they are expected to remain in the green room and have a chaperone take them to the restroom. You’re welcome to sign your child out after they perform, but they must be signed out and a chaperone must release your child to you. If your child has a medical need (allergy or other condition) please fill out a medical information form before or at rehearsal. Thank you so much in advance for your help in this very important matter! WHAT TO BRING FOR REHEARSAL & RECITAL: Please bring your child in their costume to rehearsal & recital, with their hair and makeup done. (If you need help, we’re happy to do that and we’ll gladly schedule that with you!) If your child is in more than one class, please have them dressed in their first costume and bring their additional costume(s) on hangers, well organized and ready to go. Please have all their performance shoes in their own bag and labeled. We’ll need for them to keep their items together and organized in the green room. Please have them eat before they come to rehearsal/recital. They are welcome to bring snacks – please only send water (so we avoid stains and spills), and food that will not become a stain hazard for a costume or a spill hazard for the green room. Please do not send peanut & tree nut items as we have dancers with severe allergies. Thank you so much for your assistance! 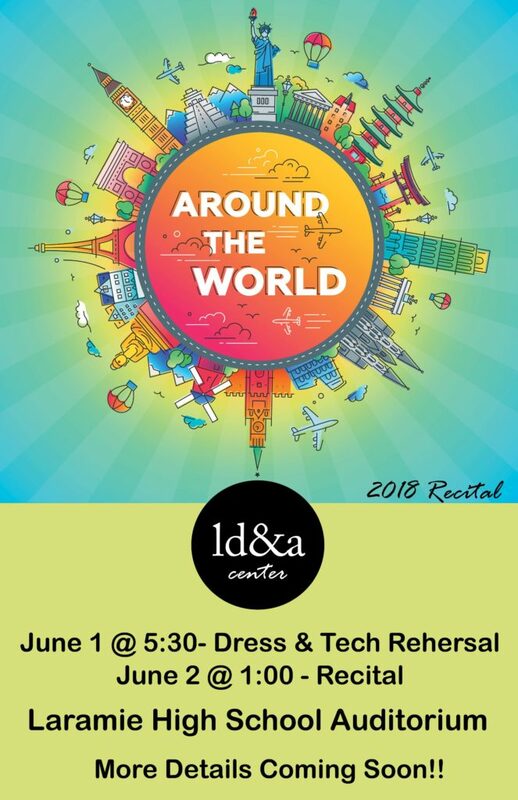 RECITAL CHECK-IN: Please arrive at LHS for recital Saturday, June 1 by 12:30 pm. Check in will be in the same location for recital as it is for rehearsal – please see above for very important notes regarding check in and out. WATCHING THE RECITAL & RECITAL LAYOUT: We’re finalizing layout of the show currently and will have that posted shortly. While we do allow dancers to be checked out prior to show’s end, we encourage everyone to stay and watch all the acts! We also encourage our dancers to join their families in the audience and watch the rest of the show! All of our classes have worked very hard on their pieces, and they would all love to have a great audience. There will be a 10 minute intermission, and we hope to have you come back and join us afterward. We also have an awards presentation for the dancers who participated in performances outside of class time, around intermission time. Our show typically lasts about 1.5 hours, and is a very dynamic and diverse event (not to mention fun!). WHO CAN ATTEND THE RECITAL? : Everyone!!! We’re very proud to offer a FREE recital to our LD&A families and the Laramie community, and we’d love to have a full house! THINGS TO DISCUSS WITH YOUR DANCER: Recital is a great experience for all dancers – they have the opportunity to dance on a big stage, with stage lights & an audience! It’s an exciting day – but it also can be nerve-wracking. On the stage it’s hard to see the audience members due to the bright lights. Their teacher will be backstage to help out, and helpers will guide them from the green room to backstage to be ready to perform. While it can be nerve-wracking, they can be assured that they will be well cared for, and should enjoy the bright lights and bring a beautiful smile onstage with them! 🙂 We also need for them to remember to stay inside the green room, and to ask a chaperone when they need to use the restroom. We’re also guiding our chaperones to ask for bathroom needs when their time to move backstage approaches. We need for them to use their inside voices and good behavior inside the green room please – we’ll have activities available for them too! Expect much more detail to come in the upcoming days – and ask questions!